Amit Shah also slammed former prime minister Manmohan Singh over his recent criticism of Prime Minister Narendra Modi. 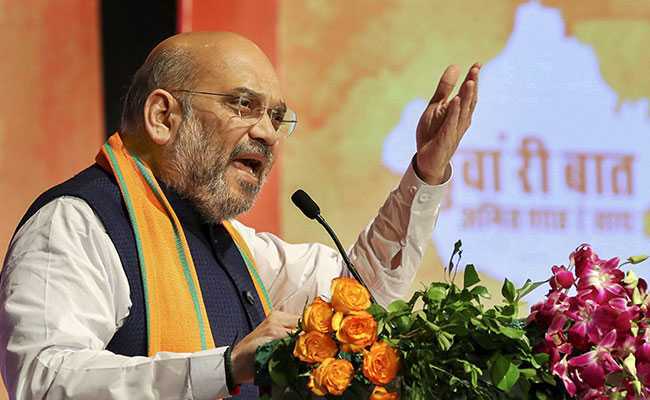 Taking a dig at the Congress for not declaring its chief ministerial face for the November 28 Madhya Pradesh assembly polls, BJP chief Amit Shah on Friday said the opposition party was an army without a commander in the state. Mr Shah also slammed former prime minister Manmohan Singh over his recent criticism of Prime Minister Narendra Modi, and claimed that PM Modi had enhanced the country's prestige in the world. "In Madhya Pradesh, the BJP is contesting the election under the leadership of Shivraj Singh Chouhan. But who is the chief ministerial face of the Congress?...It is an army without a commander," the BJP chief said at an election rally in Seoni district's Lakhnadon. "Who is the commander of the (Congress) army? A king, an emperor and a tired industrialist...Rahul (Gandhi) should tell which of these is the commander of the army," Mr Shah said, in an apparent reference to Congress leaders Digvijaya Singh, Jyotiraditya Scindia and Kamal Nath respectively. Targeting Manmohan Singh, he claimed that the former prime minister visited more foreign countries than PM Modi, but PM Modi's visits get noticed as he is warmly welcomed by the Indian community abroad. "I heard Kamal Nath was saying that Modi ji goes abroad quite often. Even I felt that he goes very often. But then I thought I must check the record of the prime minister's visits abroad and I found that he has visited fewer countries than Singh," Mr Shah said. "A journalist then informed me that when Singh used to go abroad, he used to carry two typed speeches in English and sometimes he used to read in Malaysia the speech meant to be read in Thailand and the one meant for Malaysia in Thailand. Neither the people of that country, nor the people here would get to know about it," he added. The BJP president said when PM Modi visited countries like the US, China, Japan, France, Sri Lanka and Bhutan, among others, he was welcomed amidst chants of 'Modi, Modi'. "This is neither to welcome Modi, nor a BJP leader, but it is meant for the people of Madhya Pradesh and the country's 125 crore people. Modi has raised the country's prestige in the world," Mr Shah said.